When Congressmen and local residents heard, in 1861, that there was going to be a battle between the Union and the Confederates at Manassas (I guess covert operations on both sides weren’t what they could have been), they gathered up their kin-folk and went to watch the fun. Manassas Battlefield has been a tourist site ever since. I was at Manassas for Valentines Day because, really, what girl’s heart doesn’t go aflutter over a romantic battlefield. My husband and I were in the area to spend the weekend doing wine tastings at a few of northern Virginia’s vineyards. The threat of bad weather made us abandon our winery plans but, true to form, we got the battlefield tour in. 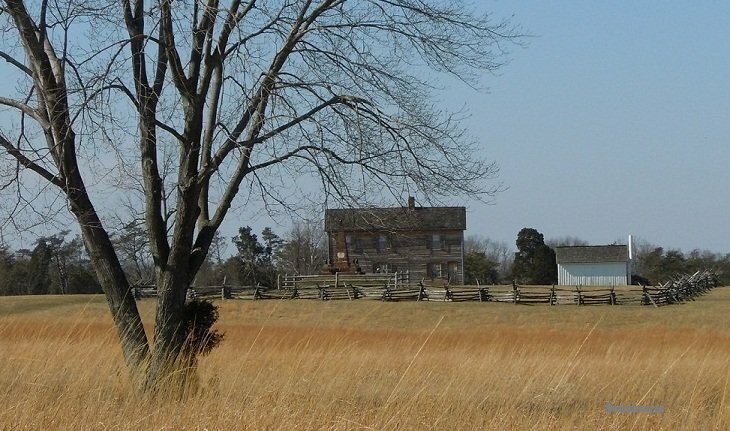 The park’s visitor center is well-situated, on Henry Hill where much of the action of the First Battle of Manassas took place. For you non-Civil War buffs who don’t want to scour every corner of the battlefield but want a good overview of what happened, there’s an audio tour that you can access with your cell phone, that takes you on a one-mile walk around Henry Hill, hitting all the highlights. Behind the visitor center is Henry house, home of the family who owned the land on which the battles were fought. Judith Henry, elderly and bed-bound, became the only civilian casualty of First Manassas when Union artillery hit her bedroom. The house was destroyed by the war but eventually rebuilt. Mrs. Henry is buried a few feet from the back door. An amazingly Freudian monument stands directly in front of the house. The Union dedicated it, in 1865, to those who died at First Manassas. Close to the visitor center also is a statue of Confederate General Thomas Jackson, on his horse, Little Sorrel. 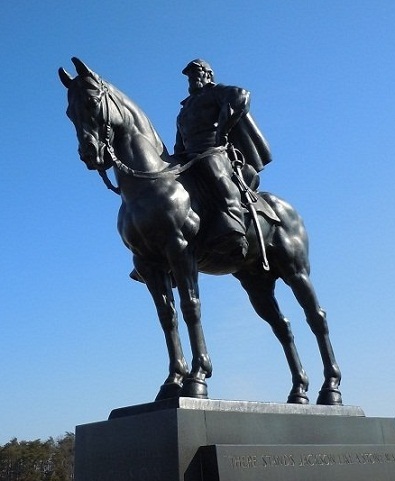 The statue is said to be on the site where he was standing when his fellow Confederate General, Barnard Bee, Jr., uttered the famous quote that gave Jackson his nickname: “There is Jackson, standing like a stone wall.” Or some variation thereof. I’m not a historian, so my knowledge bar isn’t exactly high and I always pick up some interesting tidbit at every site I visit. My favorite kind are the ones that are fun or slightly subversive — the kind that Mrs. Pisaneski never would have mentioned in high school history. My fun fact from Manassas: there’s some question whether General Bee actually said the “stone wall” thing. No one close to the generals reported such a quote in the immediate aftermath of the battle. It first appeared, without attribution, in a South Carolina newspaper article about Bee, three days later. And even if Bee had said it, at least one person refutes the idea that he said it in admiration. 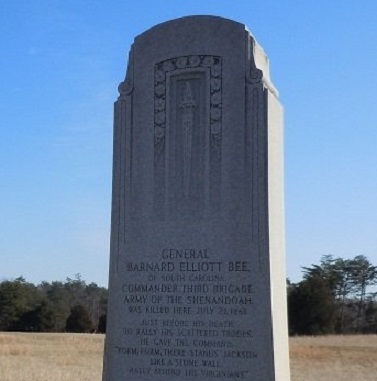 Major Burnett Rhett, aide to yet another Confederate general, Joseph Johnson, claimed that Bee spoke in annoyance, because Jackson was just standing there…like a stone wall… instead of going to Bee’s aid. The pro-Jackson faction says that Rhett was lying in the service of General Johnson, who was jealous of Jackson. Cat-fights on tonight’s episode of the Real Generals of First Manassas. Where to stay and eat: Unlike Gettysburg, the Manassas Battlefield is not next to a charming village, in the middle of the charming countryside. It’s smack dab in the middle of the ugly sprawl that’s known as suburban Washington DC. Housing developments and heavily traveled roads cut through it, and shopping centers edge it. There are lots of chain restaurants and hotels and motels in the area. But for something nicer — a historic inn or B&B perhaps — you’ll have to go about 30 minutes away, north toward Middleburg or east toward The Plains. Gallery | This entry was posted in Virginia and tagged Barnard Bee, Civil War, history, Jr., Manassas Battlefield, Stonewall Jackson, travel. Bookmark the permalink. You wouldn’t know it was in the middle of sprawl. It looks beautiful on your photos. The battlefield is an oasis of peace. I hope that they can keep it that way. There are always battles between preservationists and businesses who want to build close to or on battlefields.